This article is about primitivism in the visual arts. For the social movement, see anarcho-primitivism. For the American art style, see Primitive decorating. For art by self-taught artists, see naïve art. For other meanings of "primitivism" or "primitive", see Primitive. Primitivism is a mode of aesthetic idealization that either emulates or aspires to recreate "primitive" experience. In Western art, primitivism typically has borrowed from non-Western or prehistoric people perceived to be "primitive", such as Paul Gauguin's inclusion of Tahitian motifs in paintings and ceramics. Borrowings from primitive art has been important to the development of modern art. Primitivism has often been critiqued for reproducing the racist stereotypes about non-European peoples used by Europeans to justify colonial conquest. 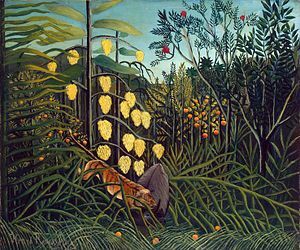 The term "primitivism" is often applied to other professional painters working in the style of naïve or folk art like Henri Rousseau, Mikhail Larionov, Paul Klee and others. Primitivism is a utopian idea that is distinctive for its reverse teleology. The utopian end toward which primitivists aspire usually lies in a notional "state of nature" in which their ancestors existed (chronological primitivism), or in the supposed natural condition of the peoples that live beyond "civilization" (cultural primitivism). The desire of the "civilized" to be restored to a "state of nature" is as longstanding as civilization itself. In antiquity the superiority of "primitive" life principally found expression in the so-called Myth of the Golden Age, depicted in the genre of European poetry and visual art known as the Pastoral. Primitivist idealism between gained new impetus with the onset of industrialization and the European encounter with hitherto unknown peoples after the colonization of the Americas, the Pacific and other parts of what would become the modern imperial system. During the Enlightenment, the idealization of indigenous peoples were chiefly used as a rhetorical device to criticize aspects of European society. In the realm of aesthetics, however, the eccentric Italian philosopher, historian and jurist Giambattista Vico (1688–1744) was the first to argue that primitive peoples were closer to the sources of poetry and artistic inspiration than "civilized" or modern man. Vico was writing in the context of the celebrated contemporary debate, known as the great Quarrel of the Ancients and the Moderns. This included debates over the merits of the poetry of Homer and the Bible as against modern vernacular literature. In the 18th century, the German scholar Friedrich August Wolf identified the distinctive character of oral literature and located Homer and the Bible as examples of folk or oral tradition (Prolegomena to Homer, 1795). Vico and Wolf's ideas were developed further in the beginning of the 19th century by Herder. Nevertheless, although influential in literature, such arguments were known to a relatively small number of educated people and their impact was limited or non-existent in the sphere of visual arts. The 19th century saw for the first time the emergence of historicism, or the ability to judge different eras by their own context and criteria. A result of this, new schools of visual art arose that aspired to hitherto unprecedented levels of historical fidelity in setting and costumes. Neoclassicism in visual art and architecture was one result. Another such "historicist" movement in art was the Nazarene movement in Germany, which took inspiration from the so-called Italian "primitive" school of devotional paintings (i.e., before the age of Raphael and the discovery of oil painting). Where conventional academic painting (after Raphael) used dark glazes, highly selective, idealized forms, and rigorous suppression of details, the Nazarenes used clear outlines, bright colors, and paid meticulous attention to detail. This German school had its English counterpart in the Pre-Raphaelites, who were primarily inspired by the critical writings of John Ruskin, who admired the painters before Raphael (such as Botticelli) and who also recommended painting outdoors, hitherto unheard of. Two developments shook the world of visual art in the mid-19th century. The first was the invention of the photographic camera, which arguably spurred the development of Realism in art. The second was a discovery in the world of mathematics of non-Euclidean geometry, which overthrew the 2000-year-old seeming absolutes of Euclidean geometry and threw into question conventional Renaissance perspective by suggesting the possible existence of multiple dimensional worlds and perspectives in which things might look very different. The discovery of possible new dimensions had the opposite effect of photography and worked to counteract realism. Artists, mathematicians, and intellectuals now realized that there were other ways of seeing things beyond what they had been taught in Beaux Arts Schools of Academic painting, which prescribed a rigid curriculum based on the copying of idealized classical forms and held up Renaissance perspective painting as the culmination of civilization and knowledge. Beaux Arts academies held than non-Western peoples had had no art or only inferior art. In rebellion against this dogmatic approach, Western artists began to try to depict realities that might exist in a world beyond the limitations of the three dimensional world of conventional representation mediated by classical sculpture. They looked to Japanese and Chinese art, which they regarded as learned and sophisticated and did not employ Renaissance one-point perspective. Non-euclidean perspective and tribal art fascinated Western artists who saw in them the still-enchanted portrayal of the spirit world. They also looked to the art of untrained painters and to children's art, which they believed depicted interior emotional realities that had been ignored in conventional, cook-book-style academic painting. Tribal and other non-European art also appealed to those who were unhappy with the repressive aspects of European culture, as pastoral art had done for millennia. Imitations of tribal or archaic art also fall into the category of nineteenth-century "historicism", as these imitations strive to reproduce this art in an authentic manner. Actual examples of tribal, archaic, and folk art were prized by both creative artists and collectors. The painting of Paul Gauguin and Pablo Picasso and the music of Igor Stravinsky are frequently cited as the most prominent examples of primitivism in art. Stravinsky's The Rite of Spring, is "primitivist" in so far as its programmatic subject is a pagan rite: a human sacrifice in pre-Christian Russia. It employs harsh dissonance and loud, repetitive rhythms to depict "Dionysian" modernism, i.e., abandonment of inhibition (restraint standing for civilization). Nevertheless, Stravinsky was a master of learned classical tradition and worked within its bounds. In his later work he adopted a more "Apollonian" neoclassicism, to use Nietzsche's terminology, although in his use of serialism he still rejects 19th-century convention. In modern visual art, Picasso's work is also understood as rejecting Beaux Arts artistic expectations and expressing primal impulses, whether he worked in a cubist, neo-classical, or tribal-art-influenced vein. Primitivism gained a new impetus from anxieties about technological innovation but above all from the "Age of Discovery", which introduced the West to previously unknown peoples and opened the doors to colonialism. As the European Enlightenment. With the decline of feudalism, philosophers started questioning many fixed medieval assumptions about human nature, the position of humans in society, and the strictures of Christianity, and especially Catholicism. They began questioning the nature of humanity and its origins through a discussion of the natural man, which had intrigued theologians since the European encounter with the New World. From the 18th century, Western thinkers and artists continued to engage in the retrospective tradition, that is "the conscious search in history for a more deeply expressive, permanent human nature and cultural structure in contrast to the nascent modern realities". Their search led them to parts of the world that they believed constituted alternatives to modern civilization. The invention of the steamboat and other innovations in global transportation in the 19th century brought the indigenous cultures of the European colonies and their artifacts into metropolitan centres of empire. Many western-trained artists and connoisseurs were fascinated by these objects, attributing their features and styles to "primitive" forms of expression; especially the perceived absence of linear perspective, simple outlines, the presence of symbolic signs such as the hieroglyph, emotive distortions of the figure, and the perceived energetic rhythms resulting from the use of repetitive ornamental pattern. According to recent cultural critics, it was primarily the cultures of Africa and the Oceanic islands that provided artists an answer to what these critics call their "white, Western, and preponderantly male quest" for the "elusive ideal" of the primitive, "whose very condition of desirability resides in some form of distance and difference." These energizing stylistic attributes, present in the visual arts of Africa, Oceania, and the Indians of the Americas, could also be found in the archaic and peasant art of Europe and Asia, as well. Painter Paul Gauguin sought to escape European civilization and technology, taking up residence in the French colony of Tahiti and adopted a stripped-back lifestyle which he felt to be more natural than was possible in Europe. Gauguin's search for the primitive was manifestly a desire for sexual freedom, and this is reflected in such paintings as The Spirit of the Dead Keeps Watch (1892), Parau na te Varua ino (1892), Anna the Javanerin (1893), Te Tamari No Atua (1896), and Cruel Tales (1902), among others. Gauguin's view of Tahiti as an earthly Arcadia of free love, gentle climate, and naked nymphs is quite similar, if not identical, to that of the classical pastoral of academic art, which has shaped Western perceptions of rural life for millennia. One of his Tahitian paintings is called "Tahitian Pastoral" and another "Where Do We Come From". In this way Gauguin extended the academic pastoral tradition of Beaux Arts schools which had hitherto been based solely on idealized European figures copied from Ancient Greek sculpture to include non-European models. Gauguin also believed he was celebrating Tahitian society and defending the Tahitians against European colonialism. Feminist postcolonial critics, however, decry the fact that Gauguin took adolescent mistresses, one of them as young as thirteen. They remind us that like many European men of his time and later, Gauguin saw freedom, especially sexual freedom, strictly from the male colonizer's point of view. Using Gauguin as an example of what is "wrong" with primitivism, these critics conclude that, in their view, elements of primitivism include the "dense interweave of racial and sexual fantasies and power both colonial and patriarchal". To these critics, primitivism such as Gauguin's demonstrates fantasies about racial and sexual difference in "an effort to essentialize notions of primitiveness" with "Otherness". Thus, they contend, primitivism becomes a process analogous to Exoticism and Orientalism, as critqued by Edward Said, in which European imperialism and monolithic and degrading views of the "East" by the "West" defined colonized peoples and their cultures. Les Demoiselles d'Avignon. The two figures on the right are the beginnings of Picasso's African-inspired period. In 1905-06, a small group of artists began to study art from Sub-Saharan Africa and Oceania, in part because of the compelling works of Paul Gauguin that were gaining visibility in Paris. Gauguin's powerful posthumous retrospective exhibitions at the Salon d'Automne in Paris in 1903 and an even larger one in 1906 exerted a strong influence. Artists including Maurice de Vlaminck, André Derain, Henri Matisse and Pablo Picasso grew increasingly intrigued and inspired by the select objects they encountered. 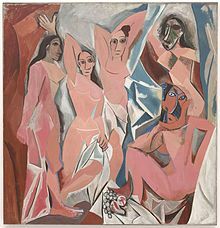 Pablo Picasso, in particular, explored Iberian sculpture, African sculpture, African traditional masks, and other historical works including the Mannerist paintings of El Greco, resulting in his masterpiece Les Demoiselles D'Avignon and, eventually, the invention of Cubism. The generalizing term "primitivism" tends to obscure the distinct contributions to modern art from these various visual traditions. Although primitivism in art is usually regarded as a Western phenomenon, the structure of primitivist idealism can be found in the work of non-Western and especially anticolonial artists. The desire to recover a notional and idealized past in which humans had been at one with nature is here connected to a critique of the impact of Western modernity on colonized societies. These artists often critique Western stereotypes about "primitive" colonized peoples at the same time as they yearn to recover pre-colonial modes of experience. Anticolonialism fuses with primitivism's reverse teleology to produce art that is distinct from the primitivism of Western artists which usually reinforces rather than critiques colonial stereotypes. The work of artists connected with the Négritude movement in particular demonstrates this tendency. Négritude was a movement of neo-African idealism and political agitation that was begun by francophone intellectuals and artists on both sides of the Atlantic in the 1930s, and which spread across Africa and the African diaspora in subsequent years. They self-consciously idealized pre-colonial Africa, something that took many forms. This typically consisted in rejecting overweening European rationalism and the associated ravages of colonialism while positing pre-colonial African societies as having had a more communal and organic basis. The work of the Cuban artist Wifredo Lam is particularly notable among the visual artists of negritude. Lam met Pablo Picasso and the European surrealists while living in Paris in the 1930s. When he returned to Cuba in 1941, Lam was emboldened to create images in which humans, animals, and nature combined in lush and dynamic tableaux. In his iconic work of 1943, The Jungle, Lam's characteristic polymorphism recreates a fantastical jungle scene with African motifs between stalks of cane. It vividly captures the way in which negritude's neo-African idealism is connected to a history of plantation slavery centred on the production of sugar. ^ See especially Marianna Torgovnick. Gone primitive: Savage intellects, Modern lives (Chicago: University of Chicago Press, 1991). See Ben Etherington, Literary Primitivism (Stanford: Stanford UP, 2018) for an account of the different understandings and critiques of primitivism. ^ a b A. O. Lovejoy and George Boas, Primitivism and Related Ideas in Antiquity (Baltimore: Johns Hopkins Press, 1935). ^ Anthony Pagden, “The Savage Critic: Some European Images of the Primitive,” The Yearbook of English Studies, 13 (1983), 32–45. ^ See Isaiah Berlin, Vico and Herder (New York: Viking, 1976). ^ See William Rubin, "Modernist Primitivism, 1984," p. 320 in Primitivism: Twentieth Century Art, A Documentary History, Jack Flam and Miriam Deutch, editors. ^ See Linda Dalrymple Henderson, The Fourth Dimension and non-Euclidean Geometry in Modern Art (Princeton University Press, 19810). ^ Natasha. "Ecole des Beaux-Arts". www.jssgallery.org. Archived from the original on 6 November 2017. Retrieved 9 May 2018. ^ Connelly, F, The Sleep of Reason, (University Park: Pennsylvania State University Press, 1999), p.5. ^ Diamond, S: In Search of the Primitive, (New Brunswick: Transaction Publishers, 1974), pp. 215-217. ^ Diamond 1974, p. 215. ^ Robert Goldwater, Primitivism in Modern Art, rev. ed. (New York: Vintage, 1967). ^ See Solomon-Godeau 1986, p. 314. ^ Writing about "Where Do We Come From?" in a review entitled "Back to Paradise", New York Times Art Critic Hilton Kramer quotes art historian George T.M. Shackelford: "Although, [Gauguin] downplayed the painting's relationship to the murals of Puvis on the grounds of procedure and intention, in formal terms he cannot have hoped that his figured landscape—for all its apparent rejection of classical formulas and execution—could escape comparison with the timeless groves that Puvis had popularized in murals for the museums in Lyon and Rouen, as well as the great hemicycle of the Sorbonne." ^ (See Edward Said's 1978 book, Orientalism). ^ Cohen, Joshua I. “Fauve Masks: Rethinking Modern 'Primitivist' Uses of African and Oceanic Art, 1905-8.” The Art Bulletin 99, no. 2 (June 2017): 136-65. ^ See Ben Etherington, Literary Primitivism (Stanford: Stanford University Press, 2018). ^ Lowery Stokes Sims. Wifredo Lam and the international avant-garde, 1923-1982. University of Texas Press, 2002. Antliff, Mark and Patricia Leighten, "Primitive" in Critical Terms for Art History, R. Nelson and R. Shiff (Eds.). Chicago: University of Chicago Press, 1996 (rev. ed. 2003). Blunt, Anthony & Pool, Phoebe. Picasso, the Formative Years: A Study of His Sources. Graphic Society, 1962. Connelly, S. Frances. The Sleep of Reason: Primitivism in Modern European Art and Aesthetics, 1725-1907. University Park: Pennsylvania State University Press, 1999.
del Valle, Alejandro. (2015). "Primitivism in the Art of Ana Mendieta". Tesis doctoral. Universitat Pompeu Fabra. Retrieved 8 July 2017. Diamond, Stanley. In Search of the Primitive: A Critique of Civilization. New Brunswick: Transaction Publishers, 1974. Etherington, Ben. Literary Primitivism. Stanford: Stanford University Press, 2018. Flam, Jack and Miriam Deutch, eds. Primitivism and Twentieth Century Art Documentary History. University of California Press, 2003. Goldwater, Robert. Primitivisim in Modern Art. Belnap Press. 2002. Lovejoy, A. O. and George Boas. Primitivism and Related Ideas in Antiquity. Baltimore: Johns Hopkins Press, 1935 (With supplementary essays by W. F. Albright and P. E. Dumont, Baltimore and London, Johns Hopkins U. Press. 1997). Redfield, Robert. "Art and Icon" in Anthropology and Art, C. Otten (Ed.). New York: Natural History Press, 1971. Rhodes, Colin. Primitivism and Modern Art. London: Thames and Hudson, 1994. Solomon-Godeau, Abigail. "Going Native: Paul Gauguin and the Invention of Primitivist Modernism" in The Expanded Discourse: Feminism and Art History, N. Broude and M. Garrard (Eds.). New York: Harper Collins, 1986. John Zerzan, Telos 124, Why Primitivism?. New York: Telos Press Ltd., Summer 2002. (Telos Press). "Primitivism meaning and methods""Primitivism, or anarcho-primitivism, is an anarchist critique of the origins and progress of civilization. Primitivists argue that the shift from hunter-gatherer to agricultural subsistence gave rise to social stratification, coercion, and alienation. " Ben Etherington, "The New Primitives", Los Angeles Review of Books, May 24, 2018.